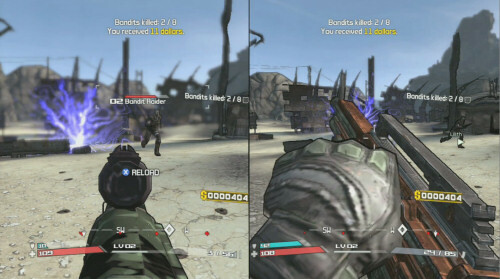 We've gotten our hands on a shiny new video of Borderlands in action during the game's 2 player split screen co-op mode. While we're still waiting on confirmation of the PC version containing the same co-op mode, the Xbox 360 and PlayStation 3 owners will be able to enjoy the company of friend next to them on the couch as they blow away bandits with 1 of three million weapons. We're still a month away from release on the title, and videos like this make the way excruciating.